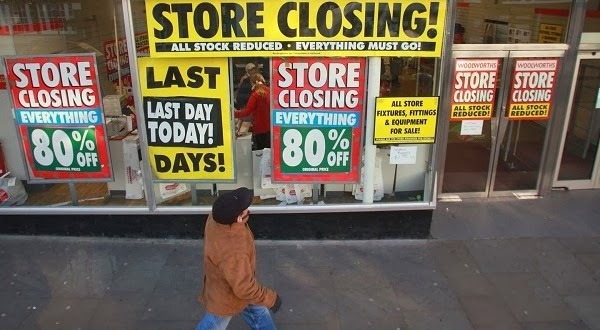 Retail Apocalypse Hits The US - There Is No Recovery! Home Editorials Retail Apocalypse Hits The US – There Is No Recovery! Retail Apocalypse Hits The US – There Is No Recovery! The next time Barack Obama or one of his talking heads spew nonsense about an economic “recovery,” remember the numbers you will read in this article and hear about in the video below. There is no recovery, it was all an illusion and it is coming crashing down at this very moment. – JC Penney, which lost $586 million in three months in 2013, is planning to close 33 stores in 19 states and lay off 2,000 people. JC Penney’s stock has lost 84 percent of its value since February 2012. – Sears has decided to shut down its flagship store in Downtown Chicago, and it has closed 300 stores in the United States since 2010. Stock analyst Brian Sozzi noted that Sear’s inventory levels have fallen by 23.7 percent since 2006. He also noted that Sears had $4.4 billion in cash and equivalents in 2005 but $609 million in cash and equivalents in 2012. Sozzi, who calls himself a guerrilla analyst, has a blog full of disturbing pictures of empty Sears stores. – Macy’s, one of the few retail success stories, is planning to close five stores and eliminate 2,500 jobs. – Radio Shack is preparing to close 500 stores, according to The Wall Street Journal. – Best Buy recently closed 50 stores and eliminated 950 jobs at stores in Canada. – Target announced plans to eliminate 475 jobs and not fill 700 empty positions to reduce costs. – Aeropostale is planning to close 175 stores. – Blockbuster has closed down all of its stores.